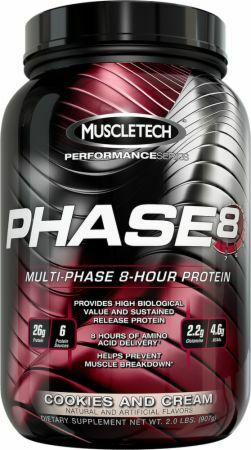 Phase8 by MuscleTech at Bodybuilding.com - Best Prices on Phase8! Very pleased with how this product, in combination with creatine and BCAA's, has been working to assist in my weight loss goals. I've struggled to lose the last 10-15 lbs of fat for the past few years. With the help of the aforementioned products, I am finally getting the results that I desired without sudden surges in hunger cravings that seemed to ruin my plans. The PHASE8 has been particularly helpful in shifting my caloric intake towards proteins and curbing my appetite. I enjoy this protein mix, really helps with recovery. My one and only gripe, this is less a powder and m,ore a dust. Makes a huge mess and has issues in my Ninja blender! This protein tastes wonderful! 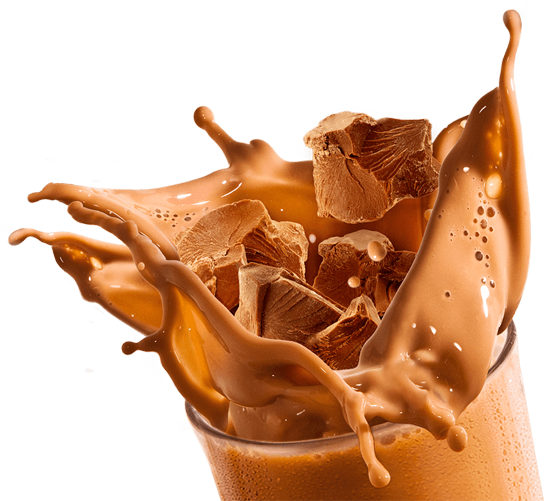 I tried the milk chocolate and it is one of the better tasting chocolate flavored proteins, and I have tried many. The powder mixes very easily, I never had trouble getting it to mix evenly. Being a protein blend, the consistency was very nice and creamy. Very impressed! I am the worst about protein shakes. I have tried 40-50 different ones and they all gross me out so I have to chug them! This one ACTUALLY tastes good! I wouldn’t mix with milk though, it is very thick! These are really delicious. I would recommend. I've been taking phase 8 now for a few weeks. I notice I'm a lot less hungry between meals while taking this. I also wake up a lot less hungry when I take it before bed. I have had improvements in both muscle strength and endurance as well. Compared to nitro tech, this milk chocolate is not as good though I would say the multiple sources of protein is to blame. Be prepared to add more water than normal for a non chalky taste. Better than most other protein powders though. Good product. First time using this product and brand for an after workout protein. 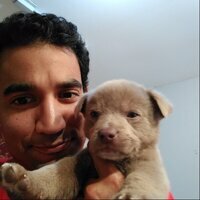 I have been using this product for a few weeks now and I am enjoying using it. The milk chocolate taste is great, I use it with almond milk. I usually have it around lunch time, so it keeps me satisfied until dinner. The only little downside is that It does take a little more time to shake in a blender cup so there isn’t any clumps. Overall I enjoyed adding this product after my workouts. 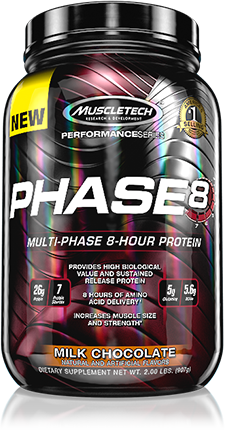 Disclaimer: I was selected to be part of MuscleTech’s ambassador program so I received a free sample of MuscleTech Phase 8. I chose to receive the chocolate flavor and at first was disappointed. It seemed chalky to me BUT was able to fix this by adjusting the water to thin it out. Overall it was good and easy to drink. I work out first thing in the morning on average 5 days a week and I take Phase 8 between breakfast and lunch with water. My second serving is taken before bed with milk and some water to thin it out. I have only been taken it for a little over two weeks and can see some results. The 2.2lb jug is good for about 24 servings, would love to see result if I took for at least 2 months consistently I have noticed an increase in muscle size and strength. I feel with the time release protein it has helped me with recovery and keeping soreness at bay. I plan on buying some more in larger quantities. I've been using this protein for a few weeks now and I love it! Mixes up nicely and tastes amazing even with water. I love that it is a blended protein, and it keeps me feeling full so I don't cheat between meals. I will definitely be purchasing this protein again and definitely recommend it! This product is one of my new favorites. I personally use a scoop with some almond milk and the flavor is unbeatable. A serving contains just 15 calories from fat versus 26 grams of protein, so this product can be taken by just about anybody. I highly recommend this product to anyone who wants to see quick and significant results in their muscle tone, strength, and endurance. I've tried a lot of different proteins and this one is really good. The flavor of this supplement is excellent. I was worried about the size of the scoop as it seems like it is larger than what I am used to but it is just fine. I added too much water on my first use and didn't lose any of the flavor. I recommend trying this product. Have been using phase 8 on and off over the last few years, plan on using it for years to come. Its affordable, usually has a good deal going on and keeps your hunger controlled when meals are spaced out. FLAVOR - chocolate is what youd expect, maybe a bit chalky but that's never bothered me. POWDER - fine and mixed well in water. Can be very thick with milk and sticks to the top of the mixer so advised using the blender ball and shaking for a bit longer than you would with water. This is a great option to start with, haven't noticed digestion issues and the 1 casein powder I've always come back to mainly due to peanut butter chocolate tasting so **** good. Contains wheat, milk and soy ingredients. Processed in a facility that processes wheat, egg, tree nut, fish and shellfish ingredients.